Mangaluru, Dec 9, 2015: It is reported that Principal Secretary (Higher Education) and in-charge Principal Secretary of Dakshina Kannada, Bharat Lal Meena, asked the in-charge Regional Transport Officer (RTO) here to increase the frequency of buses to Dr. Shivaram Karanth Pilikula Nisargadhama. 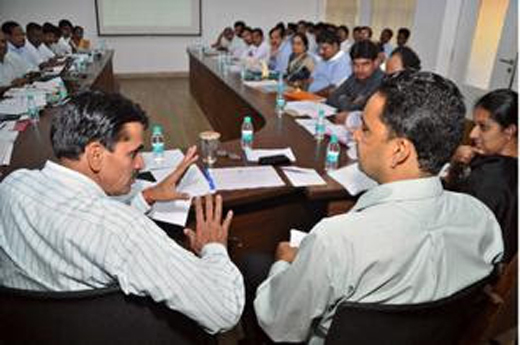 At a review of implementation of various programmes in the district, S.G. Hegde, in-charge RTO, Mangaluru, said that currently four private city buses operated between the city and Pilikula. With the Karnataka State Road Transport Corporation (KSRTC) getting new buses under the Jawaharlal Nehru National Urban Renewal Mission (JNNURM) funds, more buses could be operated to Pilikula, he said. The official, Meena asked RTO Hegde to propose before the RTA - Regional Transport Authority the extension of permits of buses that are already plying on the Vamanjoor route, in order to cover Pilikula. Secretary Meena asked DK DC Adoor.B. Ibrahim to consider redesigning the webpage of the Nisargadhama and give a virtual tour of the facets and features of the ecological destination. He said the Regional Science Centre at Pilikula has to be linked with two other Regional Centres in the State, and children should get an overview of facilities at the three centres by accessing the website. The National Informatics Centre officials were told to create an IT application by which local bodies can keep track of implementation of mandatory facilities they have to provide in public places. For example, ramps for physically challenged persons would have to be built in public buildings, and hoardings to some government programmes would have to be erected. Officials could click photographs of the work progress and upload it using the IT application. It would help in recording and reviewing the implementation, Meena said. He also reviewed the progress made by the Mangaluru City Corporation in the submission of project report to the Union government for the Smart City Project. Secretary Meena said applications designed for e-transactions and other paperless operations that are proposed under the Smart City Project should be such that it can be implemented by the State if the Centre fails to provide funds.